American dairy producers applaud small increase in exports but Canadian farmers fear erosion of their home market. MADISON, Wis. — American dairy farmers are cautiously celebrating at this year’s World Dairy Expo after President Donald Trump announced an agreement on the renegotiated NAFTA deal, now known as the U.S., Mexico, Canada Agreement, or USMCA. "Obviously we have to celebrate it," Steve Maddox, a dairyman from Riverdale, California, told NBC News. "We appreciate the President keeping us front and center on these trade negotiations, trying to get some fairness in the export market." "It was a breath of fresh air for us Americans. It gives us opportunity," said Dan Basse, a dairy farmer from Waukesha, Wisconsin. "We’re an open-market society. Now as we look forward, we see an opportunity that maybe we can export more product and raise our price to profitability." It's not entirely clear, though, how much of a benefit American farmers will receive from the new deal. Throughout his presidency, Trump has frequently denounced protectionist dairy policies enacted by Canada, which became a major roadblock during negotiations between the three countries. But in the deal, announced in the final hours before the deadline, Canada made only minor concessions to ensure its inclusion in the updated agreement. Most of Canada’s complex dairy system will stay in place, but the country will now allow American producers to have access to an expanded 3.6-percent share of Canada’s domestic market. That’s up only slightly from the 3.2-percent share originally agreed to in the Trans-Pacific Partnership. Anything exported by the U.S. above that amount will still face the steep 300 percent tariff that Trump has frequently complained about. Additionally, Canada agreed to eliminate its pricing system for "Class 7" products, which will allow U.S. dairy farmers to send more infant formula and other milk protein products to Canada. This comes after three years of steady low milk prices in the U.S., which has faced record problems of milk overproduction with no additional markets to sell to. Canadian diary farmers attending the event were less celebratory, concerned about the encroachment of U.S.-based farmers into their market. "My concerns are we keep giving up our market share. 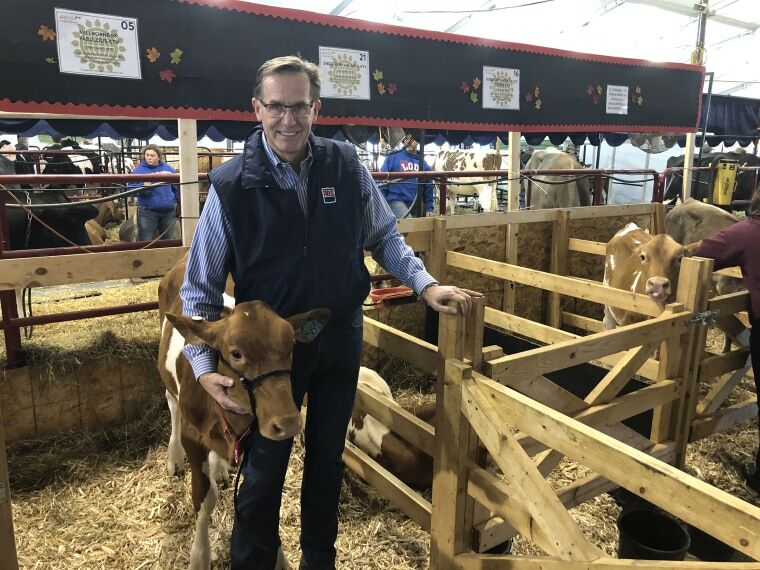 Canada is capable of supplying Canada with its own milk supply," said Martin Yoder, a Canadian dairy farmer who drove 42 hours to the expo from his home in British Columbia. Mark Stephenson, director of dairy policy analysis at University of Wisconsin-Madison, called the agreement a positive step for U.S. farmers, but not groundbreaking. "The reality is that we should temper our enthusiasm a bit," he said. "While an unconventional start to trade negotiations turned out to be a conventional trade deal, Canada gave up a little in regard to dairy and gained some in auto. Mexico didn’t give up really anything." Trump promoted the new trade agreement Tuesday, saying, "The deal we made with Canada and Mexico has gotten tremendous reviews as you see. I think it's also going to be a very good deal for Mexico, and I believe it's going to be a very good deal for Canada." Canadian dairy farmers think otherwise. David Crack, a dairy farmer in Quebec, has nearly completed expanding his dairy operation from 36 cows to 200 cows, and recently invested in a multimillion-dollar barn. "I’m frustrated, I have fear," Crack said. "I mean, dairy farmers might have to get another job because it’s going to be a situation in our country. And don’t forget — we have less cows than the state of Wisconsin. So for us, it’s a lot. For a huge country, it’s a drop. We don’t want to be a place where the U.S. can just get rid of their excess." The draft agreement will go through a 60-day review process in Congress and will need to be signed by all three countries in the new year in order to take effect. In the meantime, the U.S. is still imposing steel and aluminum tariffs, which means retaliatory tariffs from other countries are still in place. That means U.S. cheesemakers — while elated over new market access in Canada — are still restricted by a minimum 20-percent tariff from Mexico, and there has been little progress in terms of a new trade agreement with China.